Human interaction with the earth can be understood as a long history of tracing, categorizing and ordering. The way in which we map and represent the world is fundamental for our relationship with the earth and the way we deal with her. The typical visualization of the Anthropocene – the proposed name for our current era in which the human is the most important force behind geological transformations of the earth – is by way of satellite imagery and the simultaneous representation of enormous amounts of data of abstract earth processes and global human networks. These images might seem to provide us with more knowledge about our planet but they are far from transparent and lead instead to an increasing abstraction and distance from earth. GPS systems meant an enormous change in the way we navigate in the world, and with Google Earth world-wide mapping became possible. At the same time, we don’t know where we are anymore. It is this astronaut gaze, which came into existence with the first image of earth taken from the Voyager in 1969, that brought forth the idea of a vulnerable earth that has to be protected as well as managed by humans, an object made up of parts which we arbitrarily can move and change. 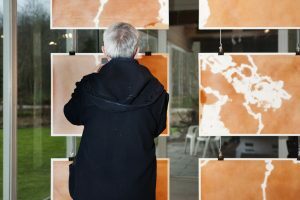 The exhibition Grounding the Map, Mapping the Ground explores, through the work of five artists, alternative relations to the earth as a critical reflection on the abstract cartographic methods that characterize the Anthropocene. From the two dimensional map of the world we need to return to the three dimensional earth to anchor ourselves again in its material processes. We need new images to tell the story of the cohabitation of human and earth again. 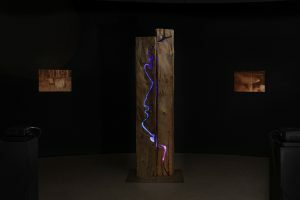 The artists presented here create new forms to map land in which the lived experience and connection with the earth is expressed. With her research project Feltscapes. Cora Jongsma sets out to connect human and landscape by presenting the land as a story. 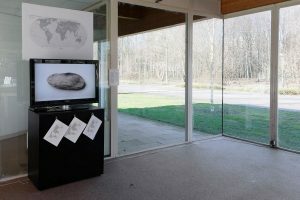 Feltscapes visualize the culture- historical characteristics of the Lionserpolder (Greidhoeke, Friesland) by showing the combination of natural formed relief and the landscape as cultivated by farmers of the ‘Old Land’, which is visible in the dwelling mounds, irregular shaped meadows, meandering ditches and special drainage systems. By tracing the morphology of the polder with felt she finds in the production process parallels with the agricultural labour of the farmers. In the process in which wool shrinks to felt, parallels are also formed with the material which creates the landscape of dwelling mounds. 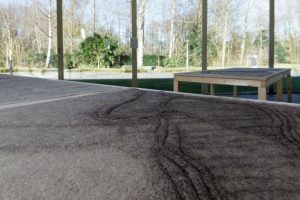 The rugs of various layers of felt form an impression of the landscape in which the material traces, holes, tracks and lines of the landscape are mapped as an immediate imprint to tell the history of co-habitation of men and landscape. 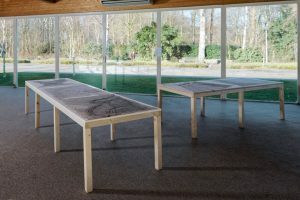 The Feltscapes are presented horizontally on tables to form topographical rugs. In this manner, they also functioned on the tables of farms as conversation pieces to inspire discussion with farmers about working the land and their relationships to the landscape. Esther Polak and Ivar van Bekkum create work about mobility and landscape. They explore how navigating through the landscape gives meaning to it. For NomadicMILK the artists travelled to Nigeria where they used satellite technology to trace the distribution of milk for the brand Peak from the harbour of Lagos to Abuja. They also traced the routes of the nomadic Fulani cow herders around Abuja. In this way they created a cartographic representation of local and global forms of contemporary nomadic life. A specially developed robot fed with the GPS data drew the collected routes in the sand. By projecting the movements of people and objects back onto the earth the people involved were able to reflect on their own tracks. The visualization of the routes gave the Fulani herdsmen and the Peak transporters a new perspective on their own perception of place, mobility and economy. The combination of routes shows the differences in spatial organization between the two milk economies. The photos of the sand maps which are shown tell the story of the landscape, the people, the economy and their movements. Antti Tenetz is an artist and experimental documentarist from Finland. His work centers on multi-disciplinairy cross overs between art and science in order to study the relation between human and nature. His themes range from the Siberian bear cult to digital representation of sensory systems of animals. His work often makes use of modern technology such as drones and satelite tracking. He focuses on experiences and relations with nature, privacy, law, landscape and natural values of cohabitation with other species in shaping our natural world. Tracing explores the relation between animals and humans and their relationship to the landscape. How can we see the presence and impact of animals through their tracks, movements and actions in the changing environment? 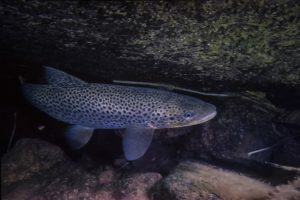 The layered data of movements of wolves and trout which are recorded between 2007 and 2014 in the regions of Nothern Ostrobothnia and Lapland form the basis of a multi-media installation which consists of a sculpture, video materials taken under water and in the air with drones, photos and visualization of data via GPS collars. 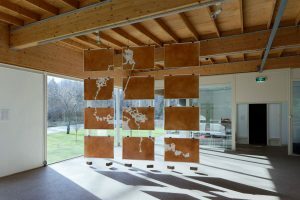 Tracing maps the specific ways of navigating land through layered representations in order to narrate the story of the co-habitation of animal and landscape. For over a decade, the American artist Amy Balkin is creating work in which climate change, the public domain and the commons play a central role. In her ongoing project A Peoples Archive of Sinking and Melting she maps a world wide loss of land as a result of climate change. The archive consists of a collection of objects derived from places on earth that possibly dissapear as a result of physical, political and economical effects of climate change (such as the melting of glaciers, the rise of sea levels, erosion of sea coasts and desertification). Each contribution consists of a reference to the place of origin and describes how the location is being influenced by climate change. A Peoples Archive of Sinking and Melting maps by showing the material traces not the existing land but land that will disappear. 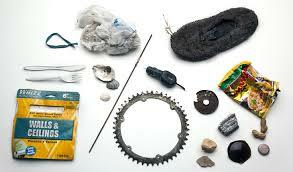 The collected materials form an archive of the future and mark anticipated loss. From 2016 onwards the archive consists of objects from Anvers Island (Antarctica), Cape Verde, Greenland, Kivalina (Alaska), Nepal, New Orleans, New York City, Panama, Peru, Senegal en Tuvalu. The archive is shown as an installation of slide projection, maps and texts. The French research and design group Bureau d’Etude, consisting of Léonore Bonaccini and Xavier Fourt, produces maps which enable people to inform, reposition and empower themselves within existing networks in order to develop an emancipated new citizenship. 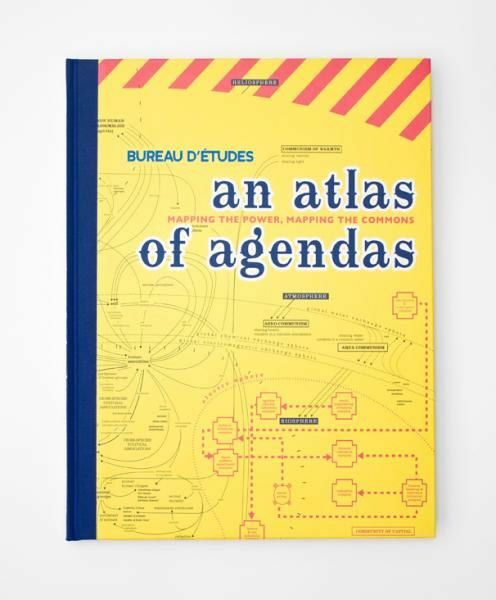 An Atlas of Agendas is a collection of these maps published by Onomatopee and brought together under the theme Mapping the Power, Mapping the Commons. Through detailed designed infographics they visualize the political, social and economic power structures in the world and activate opportunities for the self and the commons. Revealing what normally remains invisible, and contextualizing apparently separate elements within new frameworks, these visualizations of interests and relations re-articulate the dominant symbolic order and actualize existing structures that otherwise remain concealed and unknown. 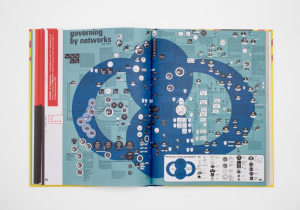 An Atlas of Agendas utilizes the opportunities of info-graphics to move from the local to the global and back again. By giving new meanings to existing networks and relationships in todays capitalist societies it opens up to imaginations of new forms of citizenship.